After the holidays and Valentine’s Day, lots of couples are starting to plan their wedding (yay, and congrats!!) One of the first and biggest decisions you’ll need to make is your wedding date, which can be tricky (though we have lots of advice to help you out in this post). 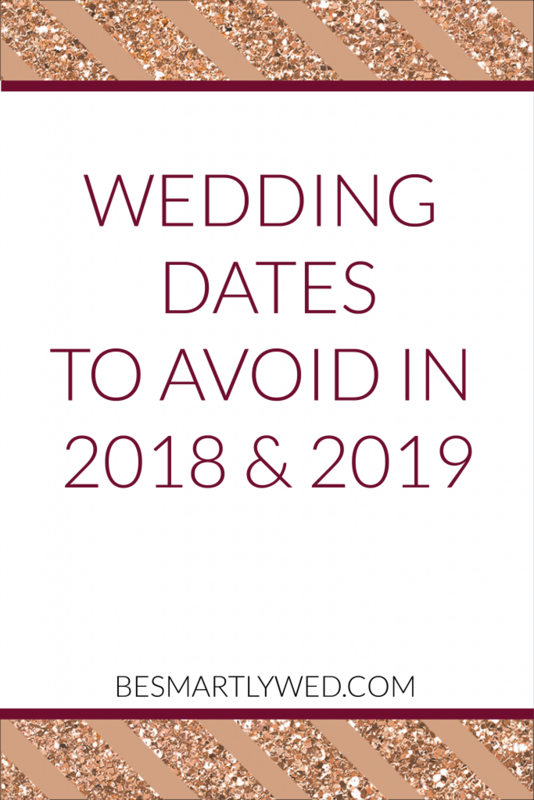 Here are some dates in 2018 and 2019 you might want to avoid when you’re making the decision – or, at least, think about the pros and cons before you choose one of these. 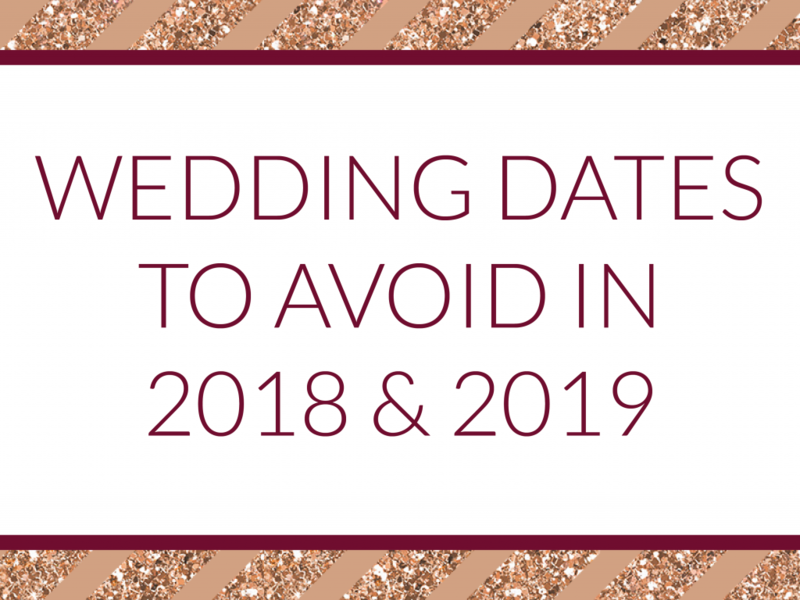 We’re not going to tell you to “avoid at all costs” (add several exclamation points) like some wedding experts might – we’re just suggesting that you cross-check against these dates before you start signing contracts, to avoid any unnecessary stress later. Philadelphia brides and grooms, if you haven’t already seen our list of area-specific dates to avoid, you can find it here! More generally, think about the kind of events you won’t want to miss, or the nights when half of your family wishes there were a television somewhere nearby. Saturdays and Sundays in January might be avoided if you come from a family of football fans (and a city that’s likely to be playing at that point… Kim was at a wedding the night of the 2014 Eagles-Saints playoff game, and most of the New Orleans-based crowd was on their phones). Other seasons to consider are March Madness (Final Four: March 31-April 2, 2018 / April 6-9, 2019), the World Series (late October), and so on. Some of these are religious and federal holidays, some are federal, some are just days when people have other plans. On holidays when flowers are often in the mix, that’s an added consideration – how much extra will you have to pay for roses near Valentine’s Day, or spring flowers near Easter? September 11th: the 11th falls on a Tuesday and a Wednesday in the next two years, respectively, so the odds that you’d choose either fall considerably, but still a date to keep in mind. These are the weekends when you and your guests may have off on Monday – long weekends are the perfect time to celebrate! Right? Well, perhaps. Depending on your intended wedding location, these weekends could mean ridiculously expensive airfare for your guests (possibly hotels, as well). Your venue might be in higher demand over a long weekend, and some vendors might take their own vacations during these dates. That doesn’t mean you can’t have a wedding on one of these dates! Kim went to a morning Labor Day wedding a few years ago, for example, which was well attended and likely saved the couple quite a bit – just be aware of the potential challenges you might face (costs, lower attendance, etc.) before choosing one. We’ve listed only the dates of the holidays below, but the prior Friday-Sunday window should be thought through, as well. These are the times of year to not only avoid the date itself, but, realistically, several days before and after. Between family gatherings, travel, cooking, and everything that goes along with the holiday season, you might end up with lower-than-otherwise attendance at a wedding just before or just after Thanksgiving or Christmas. This isn’t an exhaustive list! Don’t forget major religious holidays, like Passover (March 30-April 7, 2018 / April 19-27, 2019) or Lent (particularly on Fridays – February 14-March 29, 2018 / March 6-April 18, 2019) – any time your guests may be attending religious services, may limited in what they can eat, or may be fasting, might not be the ideal ones for your wedding. If you’re getting married in a warmer climate, mid-March could be a time to avoid the spring break crowds (and the accompanying rate hikes!) If you’re particularly superstitious, dates like Friday the 13th (April and July 2018, September and December 2019) might be ones you cross off your list. Don’t forget about birthdays and anniversaries! You and your fiance will likely know whether, for example, your mother would love to share her birthday with your wedding, or whether that wouldn’t go over as well. When in doubt, it never hurts to check; Kim’s wedding date was within a few days of one of S’s best friends’ anniversary, and while they didn’t think the couple would mind, they reached out to be sure (it was, as expected, not even a minor problem – but Kim felt better having asked). How did you choose your wedding date? Leave a comment below and let us know how you made your decision!